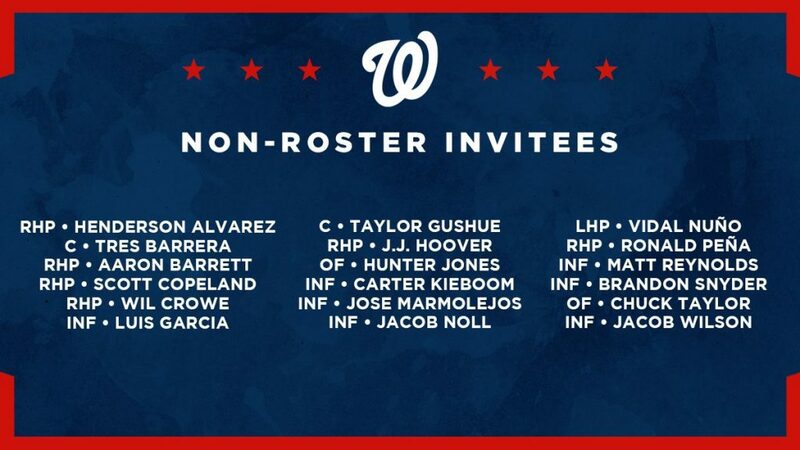 Pitchers and catchers report to Spring Training tomorrow, and the Washington Nationals FINALLY disclosed who is invited from the Minor League ranks of players not on the 40-man roster. Also on this day, we reported sourced information that Bryce Harper‘s agent, Scott Boras, was set to talk to Nationals’ owner Ted Lerner. The Nationals are the last team in the Major Leagues to report there list of NRIs. It was not hard to guess most of the names, and we disclosed last week that the biggest name on the list was Carter Kieboom as well as Henderson Alvarez, J.J. Hoover, Matt Reynolds, Vidal Nuno, Matt Reynolds, and Brandon Snyder. The two that surprised us was Aaron Barrett and Luis Garcia. It is the smallest list of invitees to Spring Training where you have most of the 40-man roster and just 15-players additionally. We will get the jersey numbers shortly so you can figure out which player is Chuck Taylor versus Hunter Jones and Scott Copeland. The extra catchers invited are Taylor Gushue and Tres Barrera but we knew they were there from early photos circulating. In fact, Max Scherzer was already on the mound today working with All-Star catcher Yan Gomes. Check out the video here. Here are the rest of the NRIs: Wil Crowe, Jose Marmolejos, Ronald Pena, Jacob Noll, and Jacob Wilson. With Bryce Harper news dominating the baseball news today, Bob Nightengale appeared on a San Francisco radio show today to say that the Nats and Dodgers were “out” on Harper, and the last two teams standing were the Giants and Phillies. We reached out to sources that said not only are the Nationals not ruled out there was supposed to be a tête-à-tête today between Boras and Ted Lerner. While there are no guarantees the Nationals will re-sign Bryce Harper, we heard Nightengale rule out the Nats before when it came to Patrick Corbin. In fact by the time Nightengale made that tweet about Corbin, he had already agreed in principle to sign with the Nationals. When Bryce Harper signs, you will know whether the Washington Nationals are “in” or “out” which happens to roughly be the name of Harper’s favorite burger joint coincidentally. With MLB’s collective bargaining agreement, this year for the first time fans will see regular season Major League Baseball over the Atlantic Ocean. The World Series champion Boston Red Sox will play a two-game series with the New York Yankees at London’s Olympic Stadium on June 29th-30th. That stadium was built for the 2012 Olympics and reconfigured for the Premier League club West Ham United. In the CBA, it allows for an opening day game in Asia, April games in Mexico, May games in Puerto Rico or the Dominican Republic and June games in the UK. MLB is already looking towards next year and has narrowed down the teams to two other rivalries which they will choose from either the New York Mets vs. Washington Nationals or Chicago Cubs vs. St. Louis Cardinals for a June series in 2020. The Washington Nationals officially open up Spring Training camp tomorrow for pitchers and catchers. Most of the participants are already there. It is very possible that there can be additional signees to camp and the active roster. When the Nationals play their one pre-season game in Nationals Park on March 25th against the New York Yankees, MASN will broadcast that game. 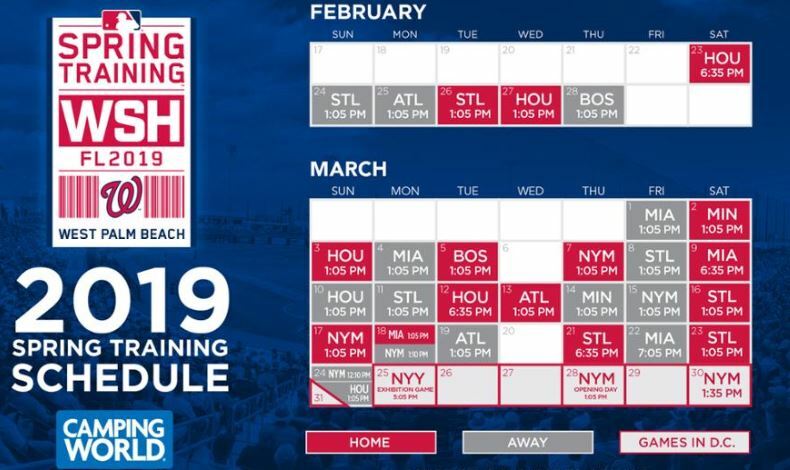 When the Nationals play their one pre-season game in Nationals Park on March 25th against the New York Yankees, that will also be broadcasted on the radio. This entry was posted in Feature, SpringTraining. Bookmark the permalink.